As usual none of the different entities seem to agree on the rules for this yet. I am asking questions and will post the answers here. We now pay to travel on "our" public land and go look at the road closures listed on the east side. Hunters that have drawn special tags will not even be able to get to some of the areas they have drawn a tag for. Some roads are not planned to be opened in 2011. OLYMPIA - Flanked by recreation enthusiasts, Governor Chris Gregoire today signed legislation that will keep state park and recreation lands open with revenue from a vehicle access pass known as the Discover Pass. Beginning July 1, 2011, you will need to display the Discover Pass on your vehicle when visiting state recreation lands managed by the Washington State Parks and Recreation Commission, the Washington State Department of Natural Resources and the Washington Department of Fish and Wildlife. The fine for not displaying the pass is $99. Do I need a Discover Pass in PDF click here "Thanks to CL"
OLYMPIA – March 30, 2012 – A single, state recreation land pass now can be used on either of two motor vehicles, thanks to new legislation signed today by Gov. Chris Gregoire. The change takes effect immediately. Holders of previously issued annual passes may enter a second vehicle license number on their existing pass. Pass transfer between two vehicles also applies to vehicle access passes (VAPs) issued free with purchases of annual fishing and hunting licenses for access to Washington Department of Fish and Wildlife (WDFW) recreation lands and water- access sites. "The Discover Pass is a great way to experience some of Washington’s most extraordinary places and this legislation makes it even easier to visit our state parks and recreation lands," said Gov. Chris Gregoire. "Our parks, some of the best in the world, rely on user support and this small investment to enjoy our public lands is well worth it." The Discover Pass was created by the 2011 Legislature and took effect last July. The pass - required to park motor vehicles in state parks and other state recreation lands - was created to make up for reductions in state general fund support for state recreation lands. The new modifications were adopted in Engrossed Second Substitute House Bill 2373, originally sponsored by Rep. Kevin Van De Wege and Rep. Steve Tharinger. The annual Discover Pass is sold for $30 and provides vehicle access to millions of acres of state recreation lands managed by the Washington State Parks and Recreation Commission, WDFW and the Washington Department of Natural Resources (DNR). One-day passes are available for $10 but are not transferable. The Discover Pass is sold through state vehicle-licensing outlets, at state parks, at some retail businesses and through WDFW’s recreational licensing system, known as the Washington Interactive Licensing System (WILD). Transaction and dealer fees may apply. Eighty-four percent of Discover Pass revenues go to State Parks, while WDFW and DNR each receive 8 percent. So far, revenue from Discover Pass sales has come in at less than half of original projections. Projected sales through the end of 2011 were $19.38 million, while actual revenue for the period was $8.2 million. "Customers have asked for transferable passes, the agencies sought this change and the Legislature has responded," said Don Hoch, State Parks director. "Customer survey results indicated that pass transferability between two vehicles could boost support for the Discover Pass. We are optimistic that the change will lead to greater public support and participation. We now depend on the Discover Pass to keep state parks and other state recreation lands open for public use and enjoyment." The new legislation also allows for future development of new types of Discover Pass products and provides flexibility in how they are implemented. Wow !!! This really makes sense. Now you can share your one discover pass between two vehicles. But only one at a time. If you take two vehicles into the hills like many of us do, you will still need a pass for both of them. Meanwhile the State is not getting any money from the heavy users. The people that live around the State Parks and the areas that really need the money for their expensive upkeep. These people walk, ride or bicycle into their favorite parks and they pay nothing. Meanwhile, back country (and unimproved area) users foot the bill for the expensive to maintain parks. When will the State people get a clue ??? Manastash Winter Recreation Area See additional information -Manastash is now managed by Washington State Parks. Discover Pass required year around. From what I read, this is going to be a hanger for your rear view mirror. Will not be transferable to our other vehicles. Answer from State "Facts Website"
Q: Will the Discover Pass be transferable between vehicles? A: No. The Discover Pass would have room for one license plate number. If you would be taking two vehicles, you would need two passes. So do we still need the Northwest Forest Pass ? From what I read, nobody directly address’s this question. When I read between the lines and use my deduction powers… it looks like we will need both. The Discover Pass is vehicle specific ! Meaning you have to have one for each vehicle ! Because we hunt on DNR land... it will cost Patti & I $120.00 ($90.00) for our 4 (3) rigs including horse trailer. and horse trailer if we unhook it from the towing vehicle. 6/1/2011 It looks like from reading the WAC that a trailer is not considered motorized and would not need a pass. From what I see, this is a very poorly written & unfair bill. The main reason for this bill is to keep the heavily used "expensive to maintain" local state parks open. Most of the main users of these parks live close and walk or ride into these parks and do not even have to buy a pass. From what I have seen in past storms, not many of these locals come out to volunteer when the park needs work. And they are the squeaky wheels that got greased with this bill. Who foots the bill and has to buy multiple pass's ? ... Users that are using less developed DNR lands. In our case, totally undeveloped DNR Lands ! As Horse People that ride in the hills a lot. Patti and I have cleared blocking timber on about 10 miles of the PCT for years (along with many other side trails) without asking for any compensation. I wonder if we will bother anymore ? Q. If I am driving through or parking outside of a designated trailhead or non-exempt campground, will I need to buy a pass? A. Yes. Anytime you are on state recreation lands managed by WDFW, DNR or State Parks, you will need a Discover Pass. Q. If I am gathering mushrooms, berries or firewood for my personal use or doing other dispersed recreation activities such as geocaching, driving forest roads, bird watching, etc., do I still need to purchase an access pass? A. Yes. All street-licensed vehicles will need a Discover Pass to access state recreation lands managed by the agencies, regardless of the type of activity or use. Q. Do I need a Discover Pass if I walk or ride a bicycle to state recreation lands? A. No. The Discover Pass is a vehicle permit. If you walk or ride a bike or horse to state recreation lands, then you won’t need the pass. Ok... Lets see if I understand this. Please answer each question so I can post the information correctly on my web page. (1) I need a "Forest Pass" to park at a trail head in the National Forest and I will also need the Discover Pass to travel over DNR land to get there ? Technically you are correct if the area has been posted as a recreation area. In reality we will be focused on those vehicles that are parked. recover my game ? Yes, you will need to have a pass for both vehicles if they are on lands managed by DNR or State Parks. Hunter or Fishers will receive a free parking pass for use on DF&W lands only with a purchase of a hunting and fishing license. (3) From what I read... the Discover Pass is a decal to be put on the front windshield. That means I need to buy a Discover Pass for each vehicle that might be used to travel over DNR land ? (None transferable vehicle to vehicle) ? That is correct, except it is not a decal but a hanger that goes on your rear view mirror. Mike here... wondering how the need for the new "Discover Pass" will affect us Hams when we park at the gravel parking lot off 18 while doing work at our repeater site at East Tiger. Lots of times we park a couple of rigs at the bottom and ride up together. Other times I have left my truck at the bottom and gone up by snowmobile or snowcat. I think that we will be developing a contractor pass that will be given to folks like yourself to gain access and do their job. Please stay tuned as we work out the kinks with the Discover Pass and try to implement by July 1st. Washington’s new Discover Pass will help keep Washington Department of Fish and Wildlife (WDFW) lands open for recreation, despite reductions in state General Fund support. Legislation creating the Discover Pass was introduced by state Sen. Kevin Ranker (D-San Juan Islands), passed by the 2011 Legislature and signed into law May 12 by Gov. Chris Gregoire. The Washington State Parks and Recreation Commission, WDFW and the state Department of Natural Resources (DNR) jointly requested legislation that led to the creation of the Discover Pass. During the bill signing, Gov. Gregoire described the Discover Pass as "a solution that allows us to help keep our state recreation lands open and accessible during the worst budget crisis in the state’s history." The Discover Pass will cost $30 per year or $10 per day for vehicle access to recreation land and water-access sites managed by WDFW, DNR and State Parks. The pass will be required as of July 1, and will go on sale in mid-June at nearly 600 retail outlets statewide that sell hunting and fishing licenses. It also will be available for purchase online at https://fishhunt.dfw.wa.gov/ or by calling toll free 1-866-320-9933. Beginning next fall, the pass also may be purchased when renewing a vehicle license through the state Department of Licensing.Holders of certain types of hunting and fishing licenses will not need a Discover Pass for access to Washington Department of Fish and Wildlife (WDFW) recreation lands and boat launches; instead a Vehicle Access Pass for WDFW recreation lands and water access will be issued free with purchase of a big-game or small-game hunting license, western Washington pheasant permit, trapping license, Watchable Wildlife decal, or saltwater or freshwater or combination recreational fishing license. Fishers and hunters will need a Discover Pass for access to state parks and DNR’s designated recreation areas, sites, trailheads and parking areas. The Discover Pass will not be needed to access undesignated DNR lands. Details on other exemptions to Discover Pass requirements are detailed at the Discover Pass website at http://www.discoverpass.wa.gov . "Fishers and hunters already support WDFW recreation lands through their license fees, and that contribution was recognized in the legislation by waiving the Discover Pass requirement for most fishers and hunters on WDFW lands," said Jennifer Quan, WDFW’s land manager. WDFW also will honor current Vehicle Use Permits on WDFW lands through next March 31. However, current VUP holders will need to purchase a separate Discover Pass for access to other state recreation lands after July 1.Revenue from the Discover Pass will be split among the three state agencies in proportion to their need for General Fund replacement - 84 percent to State Parks; 8 percent to WDFW; and 8 percent to DNR. In addition to providing a stable source of land operation revenue, the legislation provides reciprocal authority for law enforcement staff from each agency, to improve public safety and help protect state resources. For more information on the 840,000-plus acres of land and 700 water-access sites managed by WDFW visit http://wdfw.wa.gov/lands/ . Q. Where will I need a Discover Pass? A. The pass allows access to state recreation lands and water access sites managed by Washington State Parks (State Parks), Washington Department of Fish and Wildlife (WDFW) and Washington State Department of Natural Resources (DNR). These lands include state parks, water access points, heritage sites, wildlife and natural areas, trails and trailheads. The Discover Pass will be needed to access DNR’s developed or designated recreation areas, sites, trailheads and parking areas. Mark, I asked questions of you before. You answered promptly. Thank you. I know the Discover Pass is a headache for you guys at this time. Every Hunter I know is still confused about the regulations around the Discover Pass. I am trying to get this all sorted out to help all of us and do post the information on my web page. There is the legal response and then there is the operation direction we will be providing Law Enforcement Officers. Legally – The law reads that if you are parked or driving on DNR land/roads you will need a discover pass for each vehicle. Operationally – If the road system accesses other landowners, you will not need a discover pass if you are just driving through. However, if you park on DNR land and you are not conducting business with the agency the vehicle will need a pass. Mike received email stating that the DNR website says "DNR-managed state trust lands in the southeastern part of the state are scattered parcels with no developed recreation areas. The Discover Pass is not required on these lands." If you look on the DNR website for a region map, you will see that Yakima & Kittitas Counties show up in the Southeast region. But... 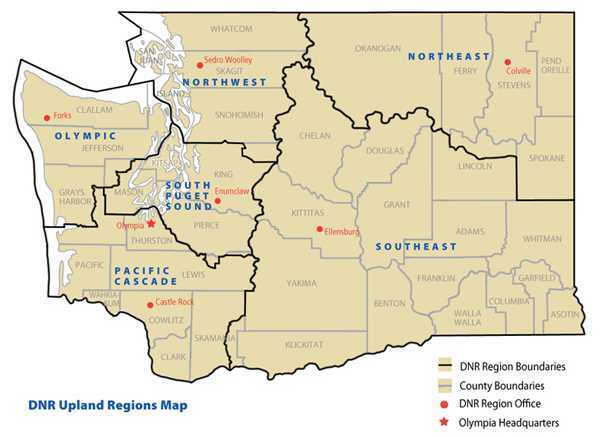 If you look at the Southwest region map... it shows the Southwest region taking in lands clear to the Columbia River. Pretty confusing to me, so I wrote more emails. You know what... After writing these emails and getting answers... I still am not sure whether Kittitas & Yakima counties are in the Southwest or Southeast region. I can’t tell if a Discover Pass is needed on the LT Murray that spreads over Kittitas & Yakima counties. So the question is… Is the LT Murray in the Southeast region or the Southwest region ? Please read the following showing my confusion. What about the southeast part of the state? DNR-managed state trust lands in the southeastern part of the state are scattered parcels with no developed recreation areas. The Discover Pass is not required on these lands. This map shows Kittitas & Yakima counties in the Southwest region. Further more, below… the dark green & the red dotted areas require the Discover Pass and the LT Murray shows in dark green on the southwest region map. So again, the question is… Is the LT Murray in the Southeast region or the Southwest region ? Good question, the Lt Murray is in Southeast Region. In order to make the map more readable we divided it into four quadrants. When doing so no lands requiring a Discover Pass showed up in the SE quadrant hence no map. Lt Murray and Ahtanum show up in the Southwest quadrant. Hope that helps if not let me know. "DNR-managed state trust lands in the southeastern part of the state are scattered parcels with no developed recreation areas. The Discover Pass is not required on these lands." No Discover Pass is needed in the South East region. Reading the South East region map, that includes any lands in Yakima & Kittitas Counties. I do appreciate your prompt replies and the honesty I noticed in our previous emails. You will need a discover pass for the large blocks of state ownership in Yakima and Kittitas, you do not need a discover pass for the scattered parcels. The block of stateownersip in the two counties are shown on the southwest quadrant map. Where can I use the Washington & Oregon Recreation Pass?